The three-day International Maritime Conference organised on the theme of ‘Global Geopolitics in Transition: Rethinking Maritime Dynamics in the Indian Ocean Region’ under the auspices of National Institute of Maritime Affairs has commenced. The President of the Islamic Republic of Pakistan, Dr. Arif Alvi graced the opening session as Chief Guest. Chief of the Naval Staff, Admiral Zafar Mahmood Abbasi was also present on the occasion. The conference is being held in tandem with biennial Multinational Maritime Exercise – AMAN 2019. While addressing the audience, the Chief Guest underscored the importance of Blue Economy and effective use of Ocean resources as key to Pakistan’s future. He stated that Indian Ocean acts as a strategic gateway for food, maritime transportation and energy supplies to the world and the presence of major powers in the Indian Ocean Region (I0R), signifies its importance under a complex security environment. 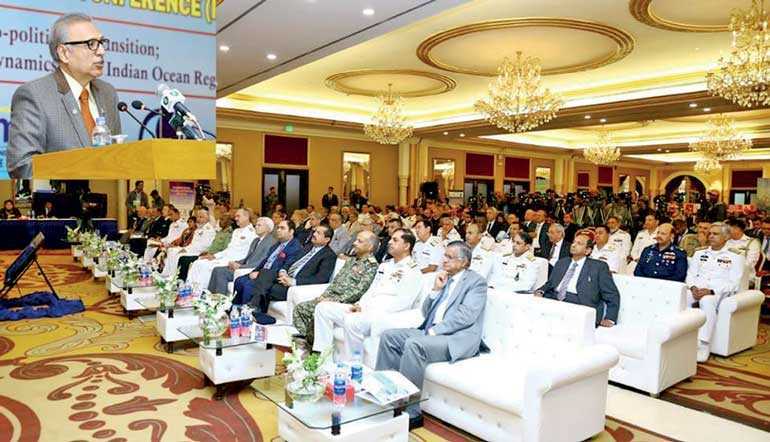 Appreciating the role of Pakistan Navy, the President said that the collaborative maritime security engagements with regional and extra-regional navies in the form of ‘AMAN-19’ signify Pakistan’s resolve and commitment towards global peace and prosperity. Pakistan as an important regional player wishes to work in harmony and collaboration with all regional countries for the common objectives of peace, stability and economic prosperity for the people of the region. Earlier, Chief of the Naval Staff, Admiral Zafar Mahmood Abbasi in his opening remarks welcomed all guests and participants and highlighted the significant role being played by Pakistan Navy in the sustenance of peace and stability in the Indian Ocean Region. The Naval Chief added that Pakistan has always been an ardent supporter of maritime cooperation, and being the pioneer partner of Combined Maritime Forces’ (CMF) task forces CTF150 and CTF 151, Pakistan has been the largest regional contributor to these constructs in terms of men and material. “On our national front, Pakistan has commenced ‘Regional Maritime Security Patrols’ (RMSP) which aims to maintain security posture in critical sea areas and choke points in the Indian Ocean,” he said. Pakistan, located at a strategic position in the Indian Ocean, needs to prepare itself for the challenges and work out viable strategy for the development of the maritime sector. Admiral Zafar Mahmood Abbasi further highlighted that the 6th AMAN Exercise is an embodiment of Pakistan’s commitment toward global peace and harmony where the naval forces from across the continent are brought on a single platform to enhance combating capabilities in the wake of traditional and non-traditional security challenges. In his welcome address, Director General National Institute of Maritime Affairs, Vice Admiral (Retd.) Syed Khawar Ali Shah, presented a brief resume including the objectives of International Maritime Conference. In addition, David N. Griffiths, Research Fellow Centre for the Study of Security and Development at Dalhouse University Canada, presented the keynote address on ‘Security Myths and Paradigm Traps: Strategic Thinking for the 21st Century’. The inaugural session was followed by two academic sessions in which various international and national scholars along with academia from Canada, China, Russian, Iran, Maldives, and Sri Lanka presented their papers.